New control and fixture options were on hand for NAB 2018 in the ETC booth. For fixtures, ETC’s ColorSource Pearl is the newest array for our ColorSource® line of fixtures. Available for the Linear, PAR, and Spot, Pearl is a variable, white-light option that can be tuned to output white light anywhere between 2700K and 6500K. The Pearl array includes the same great feature set and high-quality construction as its full-color siblings including an impressively bright output, a simple user interface, and a price point that is tough to beat. Designed for installations that depend heavily on white light such as studios, houses of worship, and architectural installations, this array features flicker-free operation and an impressively smooth dimming curve. 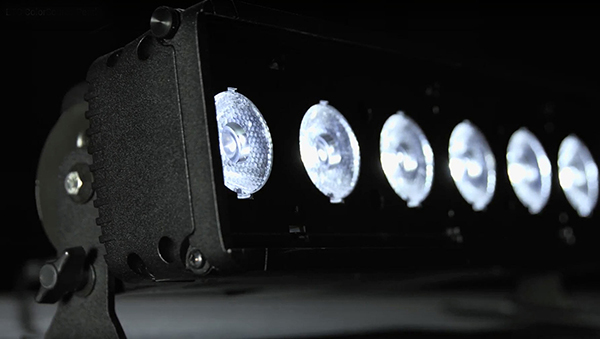 ColorSource Pearl includes the recently-announced LED fixture warranty. With a five-year warranty on the fixture and an unmatched ten-year warranty on the LED array, these fixtures are definitely built to last. Also shown for the first time from the Irideon® line of architectural fixtures, the WLZ or, Wash Light Zoom fixture, is no exception. This feature-rich design is ideal for museums, lobbies, and retail environments. Similar to the other fixtures in the Irideon family, the WLZ is available in a wide variety of color temperatures ranging from 3000 K to 5000 K, and several mounting variations; DataTrack, portable with c-clamp, canopy, and special request baby pin. This fixture is ideal for low ceiling applications or in spaces with drop ceilings where a small, powerful, yet agile lighting option is needed. The most innovative feature of the WLZ is the built-in rotating zoom adjustment at the rear of the fixture housing. This enables beam angle adjustment within an impressive range of 9-78 degrees. The zoom position markers on the fixture make fixture-to-fixture referencing quick and easy. The Irideon WLZ now also comes with ETC’s updated fixture warranty of five years for the fixture and 10 years for the LEDs. Shipping of the Irideon WLZ will begin in May. ETC’s new acquisition High End also was on display in the booth and can be seen in the accompanying High End Post in this report. Suited for studios, the new Element 2™ console adapts the award-winning Eos family control platform for venues with modest rigs and maximum hands-on fader control needs. Affordable and easy to use, Element 2 brings the fundamentals of lighting control to the forefront while allowing access to a wealth of advanced control features below the surface. Simply record cues and fade times into Element’s cue list for basic playback, or use effects, palettes, cue parts, discrete timing and follow times to create intricate lighting looks and transitions. With 40 faders and available in 1024 or 6144 outputs – this desk is incredibly flexible.